The April 7, 2019, presentation by Sue Ballew has been postponed to a future date. We will keep you posted for a reschedule of her interesting presentation on "Annie Roberts Diary and Carson City History." A special historic Blue Line tour of the Carson City westside neighborhood will be offered for CCHS members, friends and the public. It will be on Saturday, April 27, 2019, starting at 10:00 a.m. This activity is back by popular demand. (We had 60 participants on March 16!) We will start in the front courtyard of the Nevada State Museum on Carson Street and walk about 1.5 miles for 90 minutes, learning Nevada and Carson City history. The Curry House, the Ferris Mansion, the Brewery Arts Center, the Stewart-Nye House, the Clemens House, the Bliss Mansion, and several former Governors' homes, including the current Governor's Mansion, will be included. Earth Day has been celebrated on April 22nd each year since 1970, but a special Earth Day event will be held in Carson City on Sunday, April 28, 2019. "Great Basin Beekeepers of Nevada" and "Bee City USA #76 - Carson City" are co-sponsoring "Carson City Earth Day Celebrates Pollinators." 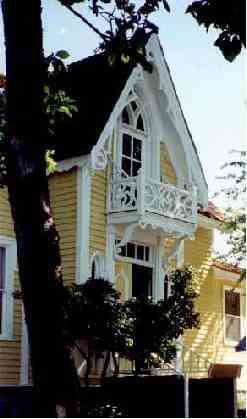 The event is from 10:00 a.m. to 3:00 p.m. at the Foreman-Roberts House, 1207 N. Carson St., Carson City. The event is hosted by the Carson City Historical Society. Bring the whole family. 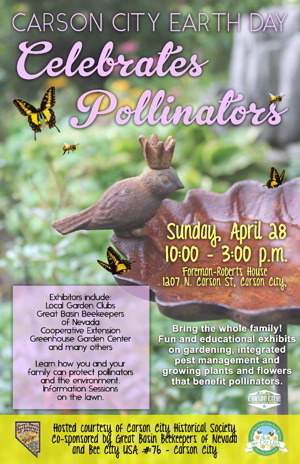 There will be fun and educational exhibits on gardening, integrated pest management, and growing plants and flowers that benefit pollinators. Exhibitors include local garden clubs, Great Basin Beekeepers of Nevada, Cooperative Extension, Greenhouse Garden Center, and many others. Learn how you and your family can protect pollinators and the environment. Information sessions will be on the lawn. To view the poster as a larger PDF, click on the image at right. Image will appear in a separate window. 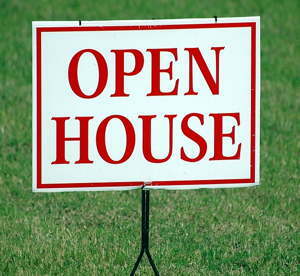 The Carson City Historical Society has scheduled three Open Houses this summer. Here is your opportunity to tour the Foreman-Roberts House and check out the historical displays in the adjoining Carriage House. The dates are June 23 (1:00 to 4:00 p.m.), July 17 (5:00 to 7:00 p.m.), and Aug. 18 (1:00 to 4:00 p.m.). Mark your calendars now to you don't miss the fun. The January 2019 edition of our the CCHS "Newsy Letter" is now available online at http://cchistorical.org/newsletters/2019_01_newsy_letter.pdf. 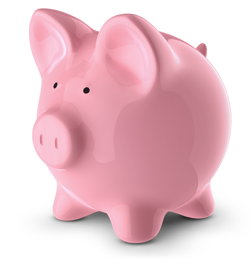 CCHS works on a fiscal year beginning January 1 and ending December 31. Dues for 2019 are $25 for single membership (1 vote) and $35 for a family membership (2 votes). Dues are generally due in January of each year. You may support us at additional levels of giving. For 2019, we are offering a special "Golden Anniversary Supporter" level of $50 to $99 to help CCHS celebrate its 50th year! The physical address for the Foreman-Roberts House Museum is 1207 North Carson St., but that address is not our official mailing address. The Carson City Historical Society is a Nevada nonprofit organizations. It is a nonprofit, tax-exempt corporations under section 501(c)(3) of the Internal Revenue Code. Donations are tax deductible pursuant to section 170(c) of the Internal Revenue Code. CCHS board meetings are held the second Monday of each month at 1:30 p.m. in the Carriage House of the Foreman-Roberts House Museum. 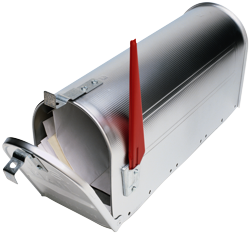 If you are interested in being put on the CCHS e-mail list, please send an e-mail to carsoncityhistoricalsociety@gmail.com and put "CCHS Membership Addition" in the subject line. We will inform you about upcoming events of the Society via e-mail. Carson City, NV 89703 Membership is $25 per person or $35 for family and includes our newsletter plus an opportunity to attend many historical events. Click here for application form. For the history of the Roberts House, click on James D. Roberts History (at left). Better yet, come and visit us. We have quite a history to tell.